If you live in any city and like their rival team, there is tension, no matter what the sport is. 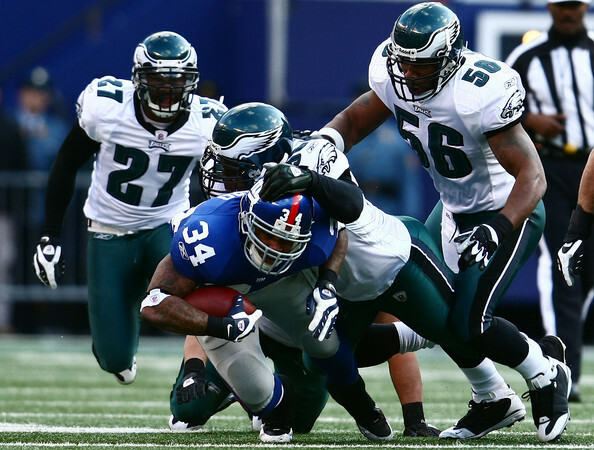 I like the NY Giants, and that is one of the Philadelphia Eagles main rivals. It’s not my fault that I like the NY Giants; it’s my dad’s. My dad grew up in NY so naturally he was a fan of the NY Giants, NY Yankees and the NY Rangers. Thankfully the Yankees had an owner whom my dad disliked, so I didn’t have to grow up becoming a Yankees fan. The funniest part about living in Philadelphia and liking another team is that when the Eagles lost a Sunday night game. It is funny how every fan is down after a sports team loses. If the Eagles have a Sunday game and they lose to a no-good team then everyone has more trouble fitting into the Monday schedule again. So it’s also awkward to walk into whatever you’re doing Monday morning with a smile and talk about sports. I have learned to watch the Eagle’s game so I can at least talk about what happened. It is quite a funny reaction when I tell some people that I am a NY Giants fan. The reaction is either “I can’t ever talk to you again,” or “How?” I haven’t lost any friends with my sports preferences, but when the Giants and the Eagles play each other, depending on who wins, there is tension. If the Giants win all of Philadelphia is a sad place, except for my family who is happy that the Giants won. If it is the other way around, I am disappointed that the Giants lost and everybody is happy that the Eagles won. So when you first meet someone, try to stay in neutral sports area, meaning that you don’t want to tell someone that you like the rival sport team or you probably have a chance of getting teased when you don’t live up to their expectations. Of course, all sports are in fun, so the teasing is always a kidding kind of teasing. As my dad always says “It’s all in good fun.” Thank goodness for that because otherwise, I would have a lot of rivals!